To promote the interests of the staff and to bolster communications between staff and the administration. To provide input to the decision-making process on issues affecting staff and the University. To support and develop activities which serve UCI, the community, and the University. To represent actively the interests of the staff at the Campus, Medical Center, and other facilities associated with the University of California, Irvine, hereinafter referred to as UCI. To promote communication between staff employees and the administration. To serve as the official nominating body for staff appointments to administrative committees, search committees, and task forces. 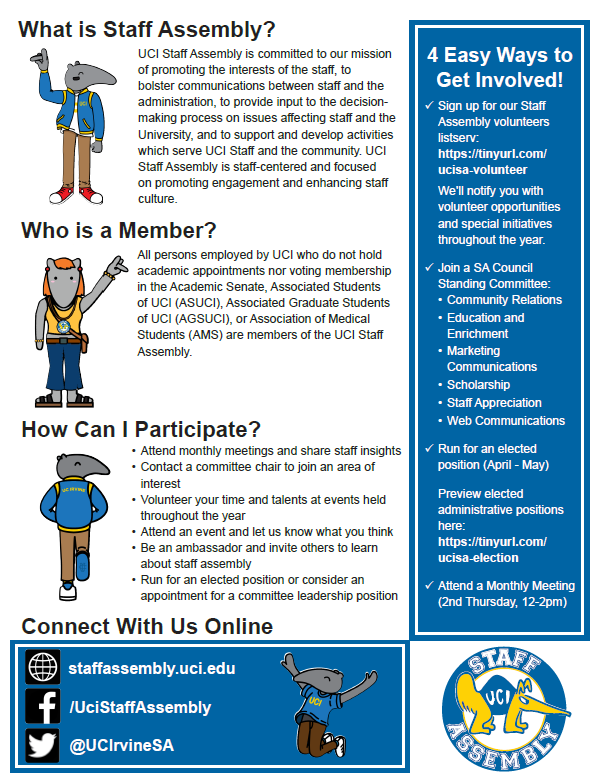 To participate actively on the Council of the University of California Staff Assemblies, hereinafter referred to as CUCSA.